Sally Ride on the Space Shuttle in 1984. Sally Ride – physicist, first American woman in space, and heroine of my youth — would have just turned 64 last week. Ride’s accomplishments were extraordinary, inspiring a generation. [In preparation for Ride’s trip aboard the Space Shuttle] Tampons were packed with their strings connecting them, like a strip of sausages, so they wouldn’t float away. Engineers asked Ride, “Is 100 the right number?” She would be in space for a week. “That would not be the right number,” she told them. That’s right. 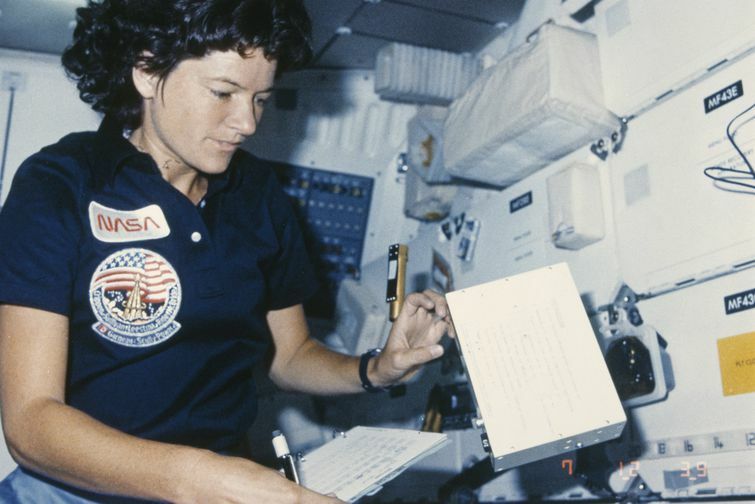 NASA was under the impression that Sally Ride’s seven days in space would require 100 tampons. NASA just wanted to “be safe” from what exactly? What did they think was going to happen up there? Were the engineers under the impression that tampons were a defense against space monsters? Or was NASA concerned that tampons were a new and unreliable technology? Was NASA worried that some of the 100 tampons might not be effective for their intended use? Were some of the tampons intended as fail-safe measures to ensure that any individual tampon failure would be an isolated event, rather than a total systemic collapse? Real talk: did the NASA engineers know what tampons are for? Seriously, were they also going to send a couple of liters of O-negative and an IV up to space, to replenish Ride after all the hemorrhaging they apparently thought she would be doing in her spare time? So are we to conclude that the space program’s legendarily selective physical standards just said ¯\_(ツ)_/¯ in the section on “women’s health”? Or were they under the impression that women like to try and discard multiple tampons in a row, Goldilocks-style, before they find one that is just right? When Sally Ride joined the space program, did anyone tell her that one of her duties would be explaining women’s hygiene products to her blissfully ignorant male colleagues? Have we properly honored her for the contributions to gender equality those conversations would have constituted? Shouldn’t her Google Doodle recognize her achievement in having uncomfortable conversations about hygiene products, thus blazing a path for future women to head into orbit? Whom do we talk to about inscribing that description on a commemorative plaque? Or at least a certificate suitable for framing? It isn’t as silly as it seems. I think they just didn’t know what effects space would have on a woman’s body in combination with being a time in history where men were oblivious to the menstruation cycle. If I were a man, I wouldn’t want to know either!